Start our Coffee Tres Leches Cake with a cake mix and watch the magic happen! 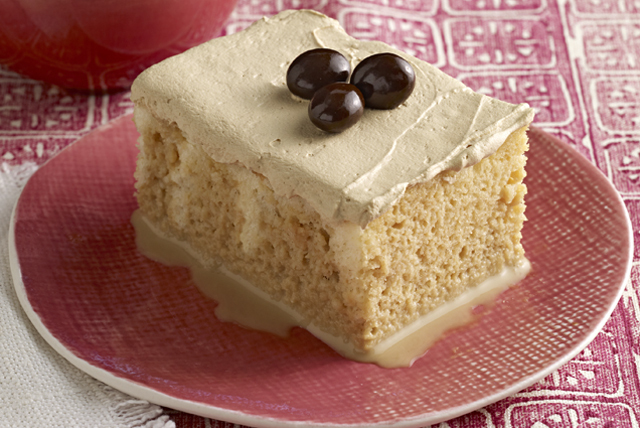 This ultra-moist & milky Coffee Tres Leches Cake has delicious coffee flavor. Prepare cake batter and bake in 13x9-inch pan as directed on package. Cool cake in pan 10 min. Pierce cake with large fork at 1/2-inch intervals. Blend milks, sour cream and 4 tsp. instant coffee in blender until smooth. Pour over cake, re-piercing cake if necessary until milk mixture is completely absorbed. Refrigerate 1 hour. Add warm water to remaining instant coffee in medium bowl; stir until dissolved. Gently stir in COOL WHIP. Spread onto cake. Top with coffee beans. This coffee-infused variation of a classic cake can be enjoyed on a special occasion. Prepare cake batter as directed on package. Pour into 18 paper-lined muffin cups. Bake as directed on package for cupcakes; cool completely. Pierce cupcakes with fork. Prepare milk mixture as directed; spoon over cupcakes. Refrigerate and continue as directed. Makes 18 servings. If chocolate-covered coffee beans are not available, shave 1 oz. BAKER'S Semi-Sweet Chocolate directly over frosted cake.